Revised! 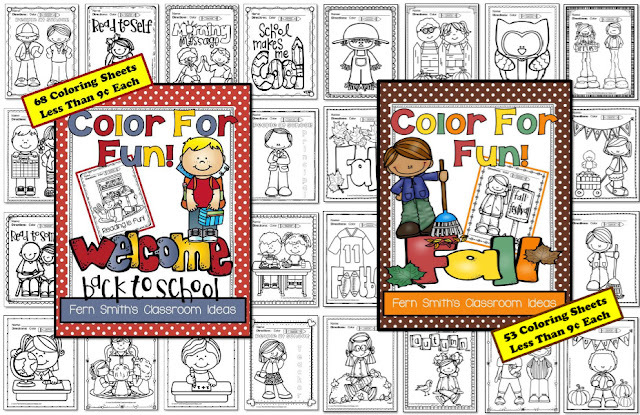 Color For Fun Fall Four Pack Including a FREEBIE - Fern Smith's Classroom Ideas! FREE Fall Color for Fun Coloring Sheet Printable in the Preview File, download it and try before you buy! Click Here to Download It. 1. Back to School Fun! Color For Fun Printable Coloring Pages! 2. Apple Fun! Autumn Color For Fun Printable Coloring Pages! 4. Halloween Fun! Color For Fun Printable Coloring Pages! Perfect for Back to School OR Fall with 220 Coloring Pages for your classroom or personal children's fun! Students can draw in a background and you can use it for all sorts of jumping off points for creative writing lessons! Click here to see it now. Terrific for your Emergency Sub Tub for morning work, let the sub have a few minutes to read your plans while the children color! Follow me for more resources and freebies! 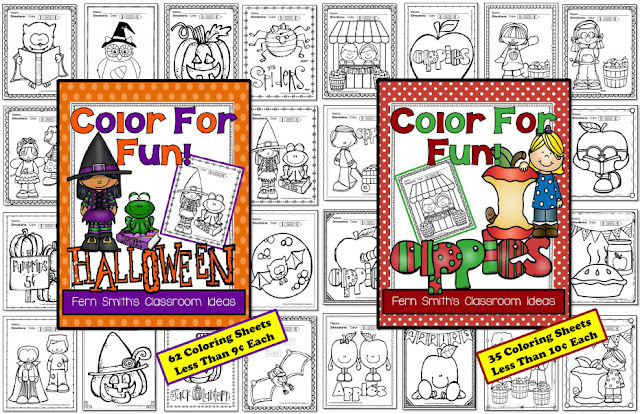 Color for Fun, October Four Pack of Printable Coloring Pages! Fairy Tale Fun! Color For Fun Printable Coloring Pages! Back to School Fun! Color For Fun Printable Coloring Pages! Adopt a Shelter Dog! Color For Fun Printable Coloring Pages! FREE Color for Fun, Veterans Day! Color For Fun Printable Coloring Pages! FREE Cinco de Mayo! Color For Fun Printable Coloring Pages! FREE Mother's Day Color For Fun Printable Coloring Pages! A Ten Bundle Back to School Giveaway! We're Giving Away a Complete iPad Air 2 Package!